Step 1: Choose your metal or finish for your monogram necklace. A popular choice is sterling silver for its affordability even though recently the price of silver has tripled. Few shoppers know that you can get the very same look of sterling silver for even less with pewter. Pewter is softer than silver, but won't tarnish and is a beautiful alternative to sterling silver. Many gold options are available too. Depending on your budget, you can choose a14k gold monogram necklace and prices for solid gold start in the $400 range. If your budget doesn't allow for solid gold, you can choose a gold vermeil which is a sterling silver design dipped in 14k gold. This is a great design to get into the monogram necklace trend without a huge investment with pricing starting at about $124.99 at CarolinaClover.com. This design can be redipped in 14k gold if the gold begins to fade. 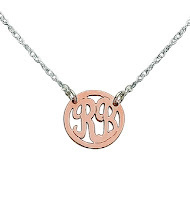 A rose gold monogram necklace is hitting its stride in the trend. This option is also created in sterling silver and dipped in a rose gold vermeil. The newest trend in monogram necklaces is color! You have many color options available to you in the enameled monogram necklace and the acrylic monogram necklace. Choose your favorite color, school colors, sorority colors or just coordinate with your wardrobe. Enameled monogram necklaceslay the color right on the initials that are created in sterling silver. Our acrylic monograms are created with a thick acrylic for durability. Step 2: Choose your monogram style in block or script. CarolinaClover.com offers you a graphic to show you your initials in script or block style. Some initials look vastly different in various positions of the monogram. So check out our graphic so you can visualize your monogram in the two styles available. Step 3: Choose single or double bail. A single bail pendant has a detached necklace allowing the monogram pendant to swing freely on the chain. The trendiest choice today is the double bail with attached necklace. This style doesn't allow for the pendant to swing freely on the chain, but the weight of the pendant assists the necklace in staying centered when wearing. Step 4: Choose your necklace length. Most monogram necklaces have a 16 inch or 18 inch chain length. We recommend a 16 inch length for junior and those who wish to wear their necklace high on their collar bone or above their neckline on a blouse. 18 inch is the best choice for wearing outside of a collar or sweater, usually lays on the breast bone and is always recommended for plus size ladies. Step 5: Consider an American Made Monogram Necklace. CarolinaClover.com has selected American jewelry artists for all our monogram necklace designs for several reasons. The obvious reason is keeping our American manufacturing live and well and feeding back into our communities and local economies, the other reason we know that our personally selected jewelers will offer the best possible service and quality materials in the creation of your monogram necklace and they will be available to service the necklace if ever needed. Step 6: Consider your timeline. Please allow up to 4 weeks for production of your custom monogram necklace. Most jewelers provide us a 3-4 week production timeline during less busy times of the year, and we've even seen 2 week timelines. See each of our necklace designs for the production timeline stated for each design. Step 7: Ask questions! Carolina Clover sales reps are here to provide you answers to your questions and if we don't know, we will find out from the jeweler and get back to you within 24 hours.